Dan Rousseau ’08 (SFA) has never been in front of a TV camera and it’s been years since he had an acting role in the theater. Yet you can enjoy his workmanship every day of the week on CNN, and if you tuned in to hockey at this past Winter Olympic Games in South Korea, you saw his work there as well. 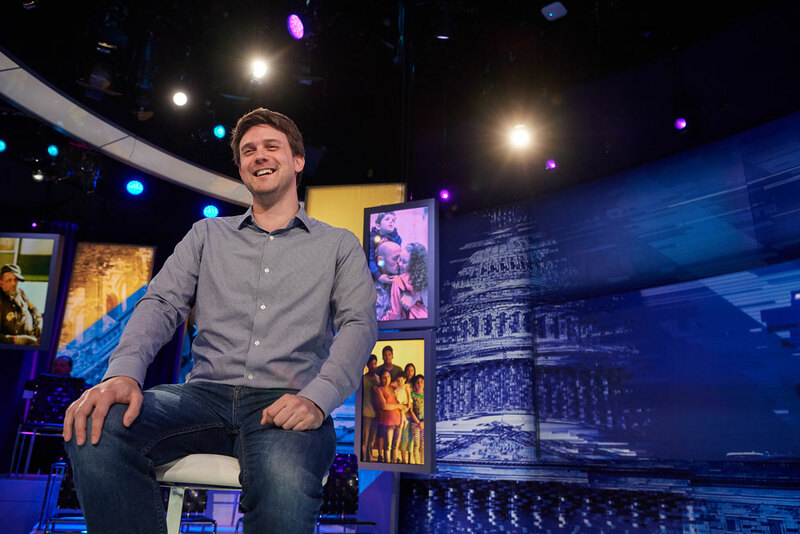 Rousseau has won two Emmys — in 2012 for NBC News coverage of presidential election night and in 2016 for the special event “CNN Heroes.” We caught up with him this summer on the set of “The Van Jones Show” at the CNN studios near New York City’s Columbus Circle. What is it about lighting that interests you? You can do almost anything with lighting. You take essentially a blank canvas and end up crafting a story through texture, through color, through movement. Plus, there’s just so many cool toys to use. There are no two lights that are the same, and then there’s the whole infrastructure of how it’s controlled. There is a computer nerdingout aspect to the whole thing. Is the audience even aware of lighting? If it’s done right, you never notice it. As part of attending or watching a show, your goal is to get lost within the show. If the lighting is bad, you are going to be noticing that, and it’s going to distract from the actual event. If the lighting is good, you’re going to feel like you are actually there and you are part of that scene. You feel the same emotion that the characters are feeling. The same thing goes if you are at a concert. I’ve lit a number of concerts in my career, and the big thing for me is how to take a song, lyrics, a melody and translate that visually. What’s it like to light a new show like “Cuomo Prime Time”? The challenge was making a distinctive look that separated our show from all the other shows done in the same studio while keeping it under budget. We were able to completely change the color palette of the set. There are a lot of little tricks I have tucked away in that set to get that look! What’s the difference between working in the studio at CNN and out in the field like at the Olympics? With the Olympics, we are taking the biggest show that could possibly be put on the air and creating a studio in somebody else’s arena. I was working the hockey venue and they didn’t have a television studio, so we had to build one on our own. It’s incredibly challenging. You are under the clock and you have to make what you have on your equipment list work. What did you learn at UConn that you use the most today? 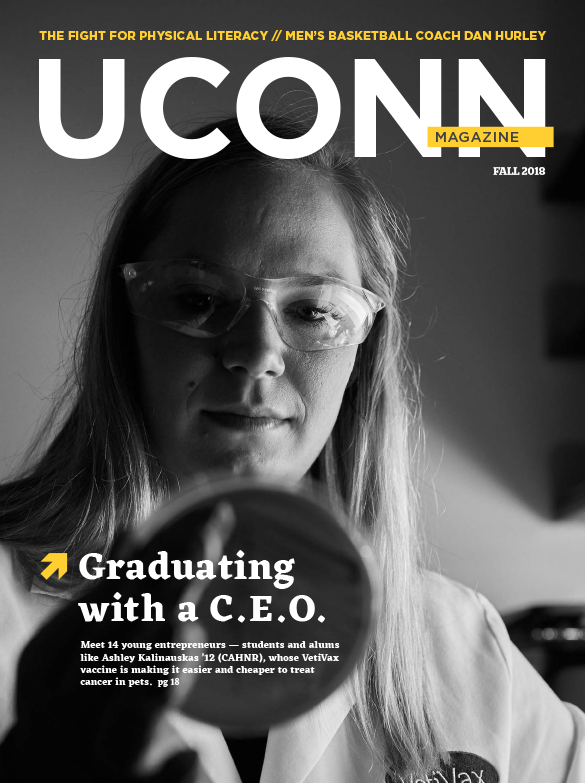 The biggest thing that helped me at UConn was the networking. I learned how to work with others and how to advertise myself. I learned how to communicate with a lot of different disciplines. That’s something I do a lot with now. Does working at CNN make you take a strong political stance one way or the other? It’s made me a news junkie just by the culture I work in. I feel connected to every story that’s going on. When it comes to the politics, I’m immune to it all, because I am exposed to so much of it. That’s not to say there aren’t certain stories that stop me in my tracks because I realize I am a part of that moment. One that I especially remember is when the Chilean miners were trapped [in 2010]. We were here until 3 a.m. watching them all come out of that little rescue pod, and we were glued to it. With an Emmy for “CNN Heroes,” that show must be very special for you. We do it at the Museum of Natural History and only have 72 hours to load the whole show and then we go live. All the stress and hard work really pays off because it’s about people doing good in the world. Hundreds of people are nominated and 10 finalists are brought to the event and then we announce the CNN Hero of the Year. You see these people that are putting smiles on other people’s faces and making positive change. I feel humbled by it because I realize that I am helping give them this special night. What do you do for fun in New York? When I need to get out of the studio, I just go and explore the city. I walk around, look at all the buildings — it’s an architectural buffet. I love the parks. I am inside so much — the more I can be outside, the better it’s going to be for me when I have to go back inside. Is there anything you miss about Storrs? I always miss Dairy Bar ice cream, but I will say I also miss the quiet setting. What an awesome and interesting career!